I took these two pictures on Sunday, specifically thinking that I wanted to show them to Aunt Pat. They were made by the "upper clay" studio (there are two clay studios here - literally upstairs and downstairs from each other) - "Wild Clay, Precise Fire". The class is simply neat all around. They are working with a wide variety of local clays, including visiting sites to dig clay. Then doing a wide variety of firing tests to create clay mixes that will work for what they want to do. 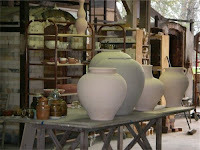 And one of the things they're doing is making large pots using a variety of different techniques, including the Onggi techniques that Michael Hunt learned in Korea. 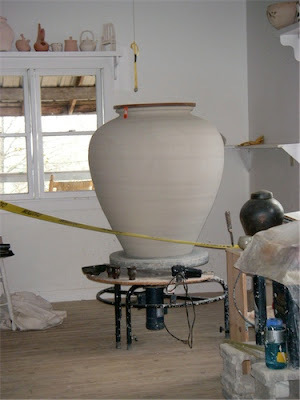 The pot below stands almost 4 feet tall. It's HUGE! And the pots above aren't slackers either; to give a sense of scale the smaller fired pots on the left edge of the table were about a foot tall. The pots are incredible. I know how hard it is to throw a large pot. The biggest I have been able to do is just over one foot and then I have trouble finishing it off, putting on the top edge but i am still trying and am getting better with practice.